(NaturalNews) A great way to improve one's health is to ensure that one eats a lot of fresh vegetables that have been minimally processed and are raw, organic and locally-grown. The problem is that not everybody can eat raw vegetables. To solve this problem, dieticians recommend juicing fresh vegetables. Patients who are improving or restoring their health and cannot eat food directly can instead drink juiced vegetables. It is recommended to consume organic vegetables rather than those which are conventionally grown for health reasons. This is because conventionally grown veggies are usually sprayed with synthetic fertilizers or pesticides. They have also undergone ionizing radiation and are considered genetically modified organisms. The Environmental Protection Agency, or EPA, says that sixty percent of herbicides, ninety percent of fungicides and thirty percent of insecticides are carcinogenic. They destroy the nervous system and lead to many health problems due to their potent and harmful chemicals. Juicing is a great way to obtain sufficient quantity of fresh vegetables in one's diet. 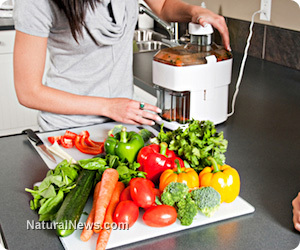 It is less time-consuming, especially if one uses a good juicer. Those who have tried it the first time realized that it is not difficult and is very simple to do. People should juice vegetables because of the absorption of more nutrients in their bodies, better consumption of these health foods and a large variety of veggies incorporated into their diet. Those who try it the first time should juice the veggies they enjoy eating to have a delicious meal. There are many kinds of vegetables that are great to juice or consume raw because of their health-building nutrients. The vegetables that are most highly recommended are asparagus, beet greens, cauliflower, dandelion greens, escarole, red and green cabbage, kohlrabi, onions, lettuce, bok choy, celery, endive, fennel, kale, parsley, spinach, tomatoes, cucumbers, zucchini, avocado, Brussels sprouts, mustard greens, green, hot, red and yellow peppers, collard greens, broccoli, Chinese cabbage, turnips and chives. Vegetables that should not be juiced often are winter squash, beets, jicama, carrots and eggplants because of their high carbohydrates content. Potatoes are another vegetable you should avoid juicing. To make the juiced vegetables tastier and more delicious, there are certain ingredients that can be added. One of them is coconut, and it gives a nice flavor and a great source of fat to balance the meal. Coconut also has medium-chain triglycerides that provide a lot of health benefits. Cranberries can also be included as recommended by researchers, because such fruits have five times higher antioxidant levels than broccoli. It helps safeguard people from cancer, cardiovascular disease and stroke. For every pint of juice, one should add four ounces of cranberries. Limes and lemons can also be added to juiced vegetables, because they give a tasty flavor and a high amount of vitamin C. Fresh ginger can also be added, because according to studies, it enhances cardiovascular health and prevents atherosclerosis, reduces cholesterol levels and prevents low-density lipoprotein (LDL) oxidation. Vegetables are important in one's diet for health reasons. Those who cannot eat them raw should try juicing them instead.